its kind of funny that hes melting, although he's wearing that big fat coat! Very nice illustration. He he, poor guy. I remember as a kid how sad I'd get when I'd watch the Frosty cartoon special. Anyhow I really like this, and your style, and seeing at least a little snow right now is a good thing with all the heat out my way. 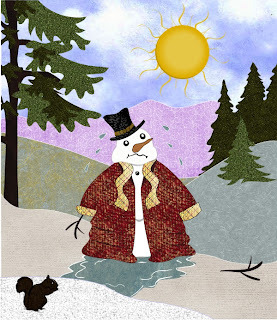 It's always embarrassing to wet oneself, oh, wait he's melting, how embarrassing! ;) Well done! I'm very jelous of your talent! Oh boy... here comes summer. Whew! Nice work! I just knew I would come here and start smiling for whatever your newest creation was.........I was so right. Love your take on this theme. Get that snowman a freezer!